 Peak performance: Billings, Mont. 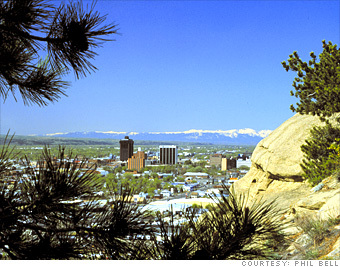 The biggest city in Montana, Billings is still a small town in size and spirit. It's the largest urban area between Fargo, N.D., and Spokane, and it serves as the regional hub for more than half a million people. But with a population of a little more than 100,000 (150,000, if you count the suburbs), Billings remains the sort of place where the average commute time is a mere 16 minutes and business proprietors are on a first-name basis with their UPS delivery guy. Major local industries are agriculture, energy, transportation, healthcare and education. An eclectic mix of businesses call Billings home, including three oil refineries, First Interstate Bank and Kampgrounds of America, which operates campsites throughout the U.S. The city's business climate is best described as temperate. Unemployment is rising but remains well below the national average. The national real estate bubble skipped Billings -- today, Montana's foreclosure rate is the fourth-lowest in the country. Big Sky Economic Development Corp.
What do you think of Billings?